Psycho-physiological approach-Member of NIP and PSYCHOLOOG NIP (Nederlands Instituut van Psychologen). I collaborated with the Clinical Psycho-physiology chair at the University of Rome “La Sapienza”. I organize courses, Multidisciplinary workshops and Permanent learning programs with Psycho-physiological approach for social and pedagogical workers, psychologists, teachers, artists promoting with cultural and social associations. My focus of research is the interdependency between tactile-sensory experiences and the development of social and personal relations. In pedagogical and educational context I have worked with children and adolescents in natural environments and in institutions as well as in the field of psychiatry. I traveled in Central and South America, where I have worked on several social projects involving women and children. I am living in the Netherlands since 2011 where I propose art therapy multidisciplinary workshops for kids and adults. Since 2003 I have my private practice as psychologist. I am trained, as psychologist, in a Psycho-physiological approach. My approach bonds mental and body processes. As well as clinical conversation I am trained in using specific relaxation training, imagination techniques and body perception experiences. I am also a teacher in an Art Therapies Master in Italy and a supervisor of psychologists. The axis of the expressive universe is therefore Ego’s psycho-physical structure, which organizes and processes different levels of experience, with their specific expressive and communicative modalities. Ego expresses itself through languages. Languages in turn, are structural components of Ego. transforming Ego’s structure. It aims to increase structural integration, the realization and expression of one’s inhibited or never developed expressive potential: substantially, art-therapeutic transformation can contribute to the amplification of the individual’s existential space. The relevance of my experiences with clay in Art Therapies is based on a clear theoretic-scientific framework: the Psychophysiological approach (created by Vezio Ruggieri).. The importance of the work with clay is the tactile and emotional experience. In child development this aspect relates with pre-semantic, non-verbal experiences and makes possible mental representations regarding self and others. Through the modelling action of clay, adults and children, feel their presence of the here and now, as well as their own efficacy. This allows a creative adaptation to reality and a feeling of pleasure and self-esteem. Through this sensual material the person may encounter his own inner representation of the relation between ‘Me’ and ‘not Me’, using it like a transitional object. The manipulation of clay involves a lot of manners of tactile experiences of touching, such as: pressing, tapping, stoking, skimming etc…that should not be considered as mechanical movements but as relational ways to contact others and the world and they are mirror of personal psychophysical tensions. Those personal gestures deal with: needs, memories, feelings, images, desires and enable the person to shape inhibited or negated emotions that can be expressed and integrated into their self-representation and relational experience. This process represents the activity of an Ego that can have new configurations fitting the process of experiential integration that the Ego can express its own auto-representation taking new shapes that are aspects of the identity and can be manifested to the consciousness. To knead, to mould the clay can turn on a lot of sensations, images, and feelings, very new for the patient and can permit to give form to the complex process of Projection.. A chunk of clay can be manipulated. Its shapes can change continuously, providing the possibility for the person to destroy, to decompose and build again and re-create his/her internal objects. The space and the time of the moulding action are also considered as a transitional area, like in Winnicott’s theory. The work with clay has a lot of advantages compared with other materials because it responds easily to our touch and this quality consent children to be conscious and to learn various ways of touching such as: intensities, degrees of pressure (to skim, to stroke, to squeeze, to press, to support..) rhythm, location and duration. Actually the action of moulding and handling clay represents an important stimulus in the child psycho-physic development. Those tactile sensorial experiences play a big role during life in building the representation of the internal world and of the others. Since it is not necessary to be an artist the kid can really enjoy the pleasure to imagine and produce a concrete object with his/her hands and he/she has the opportunity to learn the skills needed to shape clay according to his/her imagination. 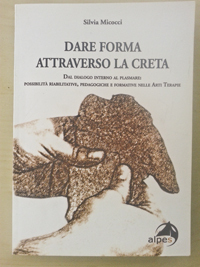 – Discovery of the personal contact style with the clay and the possibility to give shapes to emotions. – Development of sensorial tactile sensitivity, enriching expressive possibilities. -Learning various easy techniques to sculpt using usual and unusual tools. – The development of skills in solving the difficulties in creating particular imagined or copied shapes and support self-confidence and self-esteem in creating new forms. – Facilitate the group communication in sharing the proces sharing the result, and moulding together, learning to wait our turn and the respect of others work. – The development of concentration and attentive skills in the process of moulding. In this work we consider the experience of free expression in a pedagogical relation. This can be possible through the presence of stable and flexible borders, which are useful to define the context and the relation of the experience. The structure is needed to experience the freedom. In this elaboration the weaving reflects the relation between structure and freedom. In this practical work the hand-held loom frame represent the context of the experience, the warp (the vertical threads) represent the stable and flexible rules and the weft (the horizontal threads) represents freedom. From our psychophysiological point of view, weaving is not a mechanical action, equally the whole body is involved in important relational gestures like pushing, pulling, opening, etc.. Infact the basic movements we propose are like a dance or better a sort of rocking. Different tensions of the threads can be observed, and they reflect the muscular tensions of the person involved. The weaving process is a kind of a narration of the Ego narration. The colours chosen, the kind of threads, the different tensions of the threads (with one can create a thick or a slack plot, holes, knots, etc) reveal that the organisation of the body is the base for every psychological event. Weaving allows gives the possibility to re-organise the cognitive process in every gesture.